A quiz: how many pieces of information do you need to accurately and unambiguously locate a spot on the earth? It depends if we’re talking about locations on a globe, in which case we can use latitude and longitude, or locations on a map, in which case we will need coordinates and a projection too. Since maps are flat, we need a transformation from the curved globe into flatland — a projection. So how many pieces of information do we need? The answer is surprising to many people. Unless you deal with spatial data a lot, you may not realize that latitude and longitude are not enough to locate you on the earth. Likewise for a map, an easting (or x coordinate) and northing (y) are insufficient, even if you also give the projection, such as the Universal Transverse Mercator zone (20T for Nova Scotia). In each case, the missing information is the datum. Why do we need a datum? It’s similar to the problem of measuring elevation. Where will you measure it from? You can use sea level, but the sea moves up and down in complicated tidal rhythms that vary geographically and temporally. So we concoct synthetic datums like Mean Sea Level, or Mean High Water, or Mean Higher High Water, or… there are 17 to choose from! To simplify things, there are standards like the North American Vertical Datum of 1988, but it’s important to recognize that these are human constructs: sea level is simply not static, spatially or temporally. To give coordinates faithfully, we need a standard grid. Cartesian coordinates plotted on a piece of paper are straightforward: the paper is flat and smooth. But the earth’s sphere is not flat or smooth at any scale. So we construct a reference ellipsoid, and then locate that ellipsoid on the earth. Together, these references make a geodetic datum. When we give coordinates, whether it’s geographic lat–long or cartographic x–y, we must also give the datum. Without it, the coordinates are ambiguous. How ambiguous are they? It depends how much accuracy you need! 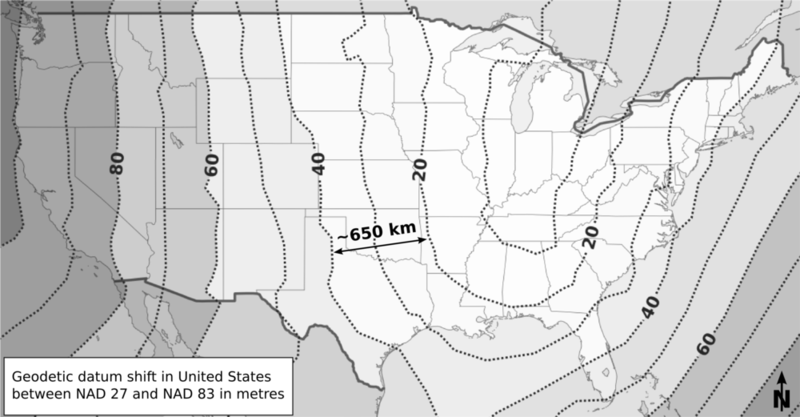 If you’re trying to locate a city, the differences are small — two important datums, NAD27 and NAD83, are different by up to about 80 m for most of North America. But 80 m is a long way when you’re shooting seismic or drilling a well. • NAD27 — North American Datum of 1927, based on the Clarke 1866 ellipsoid and fixed on Meades Ranch, Kansas. This datum is widespread in the oil industry, even today. The complexity and cost of moving to NAD83 is large, and will probably happen v e r y s l o w l y. In case you need it, there’s an awesome tool for converting between datums at ageo.co/17EKX2c. • NAD83 — North American Datum of 1983, based on the GRS 80 ellipsoid and fixed using a gravity field model. This datum is also commonly seen in modern survey data — a big problem if the rest of your project is NAD27. Since most people don’t know the datum is important and therefore don’t report it, you may never know the datum for some of your data. • WGS84 — World Geodetic System of 1984, based on the 1996 Earth Gravitational Model. This is the only global datum, and the current standard in most geospatial contexts. The Global Positioning System uses this datum, and coordinates you find in places such as Wikipedia and Google Earth use it. It is very, very close to NAD83, with less than 2 m difference in most of North America; but it gets a little worse every year, thanks to plate tectonics. To sum up: always ask for the datum if you’re being given geospatial data. If you’re generating geospatial information, always give the datum. You might not care too much about it today, but once you have spent days trying to unravel the location of a well this will change. A version of this essay first appeared as a blog post in March 2013, ageo.co/16NLJu3. The image is licensed CC-BY by Wikimedia Commons user Alexrk2.